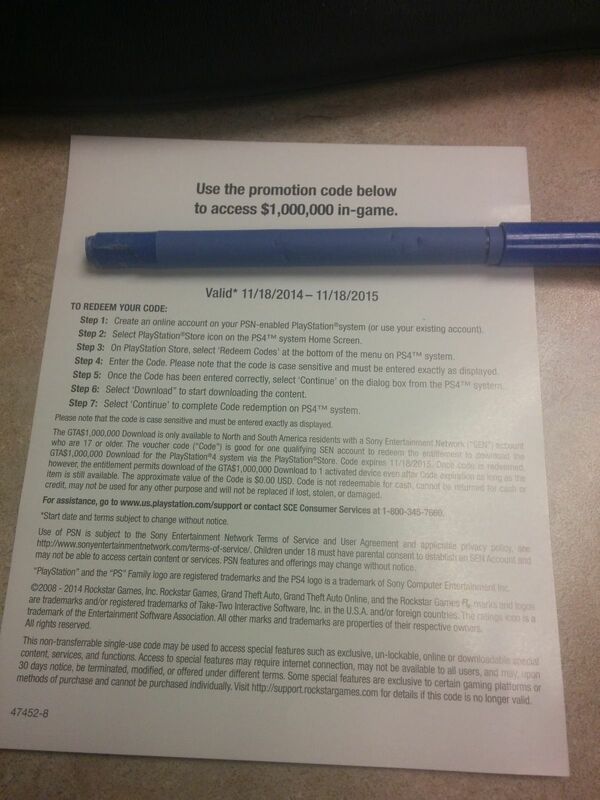 This is for the pre-order DLC ONLY for the PS4 version of Grand Theft Auto 5 You are bidding on the $1,000,000 in-game bonus code. The Code is still unused. These dlc codes came from the Preorder of the Day One Edition of Grand Theft Auto 5 and I just have no need for the DLC codes as I do not play online much on it. This auction is not for the game!!! 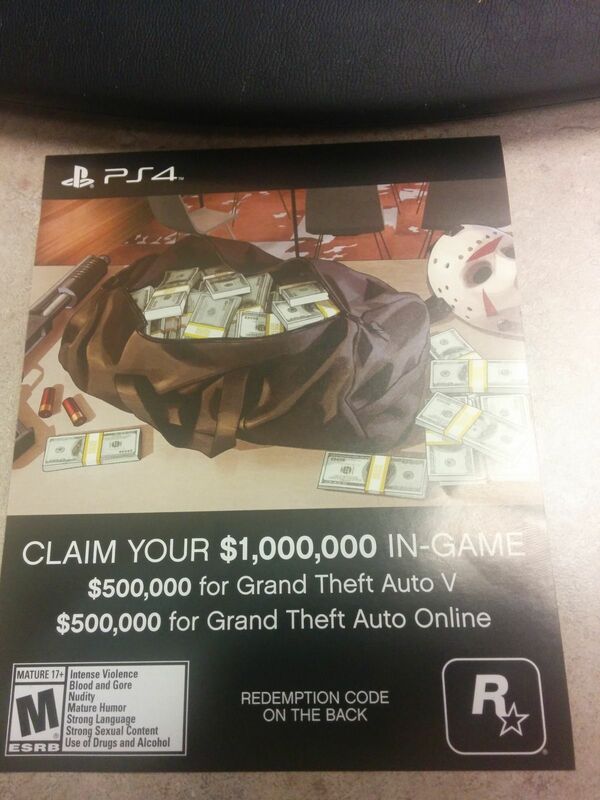 The DLC includes the code for $1,000,000 In-Game Redemption Code. $500,000 for Grand Theft Auto V and $500,000 for Grand Theft Auto Online. It is limited time offer and a great add to anyones game. They are selling for $15-20 on ebay. ASKING $15 Paypal Non-CC Verified. Will trade for Digital Games on either the Xbox one or PS4. Open to offers as well. I don't know why someone would pay $15 for this. 500K in single player is easy to make and 1.25 mil online is $20. So 500k online money is like $10 retail. exactly...I never had any money issues in single player. I would only want the online money. Even that wouldn't be a big deal to me though. Earning online money was never too hard. I just did a lot of races and would steal a nice car every 45mins and sell it to the paint shop for $5k-8.9k. Doing that, I can easily earn online money. I am mainly just posting it to see what people offer. Hopefully lookong to trade it for something just don't want to deal with it through ebay! so what are you realistically looking for? I know you got this simply for pre-ordering on the current gen system. I bought the holiday bundle and got gta5 free with my ps4. I wouldn't mind some extra online cash, but no way would I pay 15-20. I had gta5 on ps3...all I gotta do is transfer my online account to ps4 and I should have over a million. i got 500k just because the online sucked when gta5 first come out. an extra 500k would be nice though. If people are gonna make $10 off their code, I might wanna offer my Xbox One version. Still have it if anyone is interested! ill do $5 dollars through credit/debit on paypal. thats it.